Not many babies are conceived in a bog, but that was the case where the Portglenone Branch of C.C.E. was concerned. Devotees of traditional music returning from Listowel where they had supported Ann O'Brien (R.I.P.) competing in the All Ireland Solo Fiddling Competition, were in the middle of the Bog Of Allen, when Colm O'Brien, enthusing about the variety, the standard and the general excellence of the music heard that day, went on to wonder if it could ever happen in Portglenone. Fellow passengers Brian Quinn and Joe Clarke didn't see why not, and thus the conception in the bog! The infant was born in October 1973 and the new baby branch was cared for by the caretaker group consisting of Colm O'Brien (in whose house the first meeting was held), Ann O'Brien, Matt McAteer, Edith Spiers, Brian Quinn and Willis Patton. The baptism took place in "The Wild Duck" in 1974 when at the first A.G.M. the infant branch was declared a fully fledged member of Comhaltas. The youngster thrived....but not without teething problems, growing pains and minor ailments. There were differences of opinion with the Central Council of Comhaltas about the interpretation of the Bunreacht, with the B.B.C. and their televising of the Branch's activities in Bernard Falk's "Nationwide" and many more niggling and annoying problems. But there was a nursery - a safe haven where the real and important work went on......"The Loft", a small upstairs room behind Brian Quinn's shop (now Pat Fullan's), where the foundation members joined with Joe Clarke, Tommy Doherty, Henry McErlean, Sean McGuigan, Willie John McCann, Tommy McCann, John Weir and others practising tunes, planning sessions, and masterminding the welfare of the thriving organisation. Progress was constant and highlights were numerous in the Branch's development. Members went on to win competitions at County, Ulster and All Ireland level; the Branch was featured in a T.V. programme. 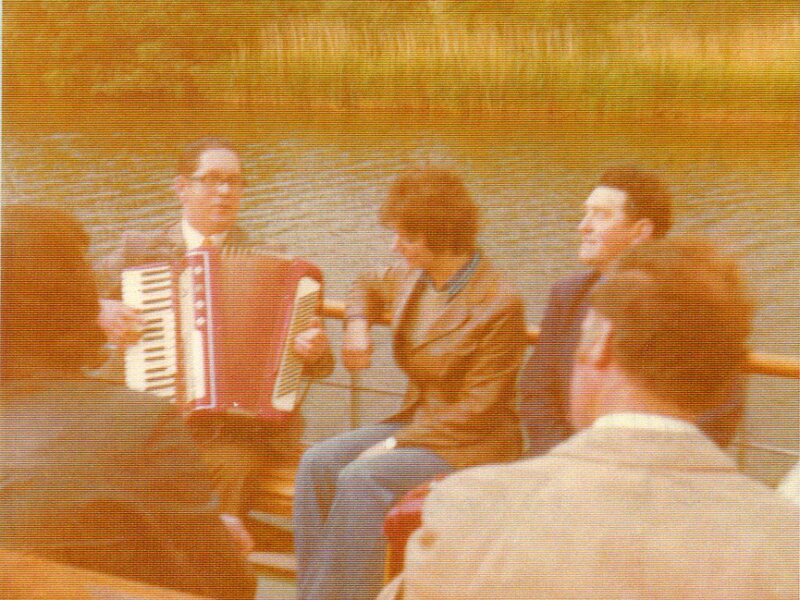 Donncha O Dulaing made a radio broadcast involving the members; an article (by M McAteer) was published in "Treoir" in 1974 giving details of an end of year session held on board the "Maid Of Antrim" as it sailed from Portglenone Quay to Lough Neagh and back to an eel supper at "The Wild Duck", with Tony McAuley and Len Graham among the 80 plus who crammed the boat. The first Antrim Fleadh was held in Portglenone in 1975. The competitions held in Portglenone in that initial year complemented the situation for Antrim and Derry competitors who competed for entry to the Ulster Fleadh at the Ballymena Feis. At the Feis, competitors qualified in Tin Whistle, Flute, Fiddle, Accordian, Duets and Trios and Miscellaneous Instruments. In 1976 all Fleadh competitions were held in Portglenone on a truly memorable occasion. Now turning 40 years of age this year (2013), the Branch has matured and blossomed. Almost 100 children and adults receive weekly tuition in instrumental music; sessions and functions are successfully promoted; a growing band of competent musicians exists in the locality - some having All Ireland honours, and others have appeared on T.V. shows, at The Lyric Theatre, convalescent homes, hospitals etc; and above all the inter-community spirit, so much emphasised by the foundation members, still flourishes and thrives, and brings together all sections of the community. Our musicians joined forces with neighbouring Branches in the area to compete under the banner of Cois Locha and Ceoltoiri Crosskeys in Grupa Cheoil and Ceili Band competitions. This proved a very successful venture and resulted in All-Ireland honours in the Senior Grupai Cheoil competition at Clonmel 1994, the 12-15 Ceili Band Title at Enniscorthy 1999, the 15-18 Grupai Cheoil Title at Enniscorthy 2000 and the 15-18 Ceili Band Title at Listowel 2002. The Portglenone Junior CCE group started up again properly in October 2008. With the help of Harry O’Neill and Eamon Graham, Kieran Convery leads the Wednesday evening junior sessions in The Wild Duck Inn from 7pm to 8pm every week. Public interest and word of mouth helped to increase numbers attending the weekly sessions from around 10 or 12 musicians to around 30+ children and several adults/parents taking part by the end of November. The groups first ‘Gig’ took place after they were invited to entertain the residents of the Portglenone Fold Community. Packed into their main day room, the young musicians played quite a selection of traditional tunes which also included a few Christmas carols to finish on a seasonal note which also got the residents singing along too! This years County Antrim Fleadh in Ballycastle was also a very special moment for quite a few young musicians from the Portglenone area. This was because it was the first time they had ever competed in any sort of competition let alone played in the public domain. Many of these musicians had only started playing Irish Traditional music in September 2008 at our CCE branches music classes. On the Friday night of the Fleadh, the Portglenone Junior Irish Traditional musicians joined forces with the Cushendall, Loughgiel, Ballycastle and Dunloy CCE branches and played at the Opening Fleadh Concert. There were over one hundred musicians on the stage for the first half of the concert, all playing a mixture of tunes which were agreed and arranged by the tutors from the local branches. Kieran has continued to work very closely with Kieran Dempsey from the Cushendall CCE branch and together they have produced a standard set of tunes for all young musicians in the County Antrim area to learn and eventually play together. This is in effect called Booklet 1 and already Booklet 2 has been formulated and has been issued to the young musicians at last Wednesday nights session. Further ventures for Portglenone CCE Junior musicians included playing on the ‘Gig Rig’ on the Saturday of the Ulster Fleadh in Castlewellan 2009. Even with the holiday season in full swing in late July, many young CCE members and their families made themselves available and completed the long journey to the Co. Down town for this special event. The group played quite a number of tunes, songs and dances and were extremely well received by the Fleadh officials and the large audience in attendance. Early September arrived and after having been invited by Gig’n the Bann Chairman, Brian McCart, the group were still rehearsing for their stint on the Ann O’Brien Tribute Stage of the Gig’n the Bann Festival which was having its 10th anniversary. A very special performance was needed and that is what the audience got with a fine selection of tunes played, songs from both Carla McPeake and Róisín O’Neill and a traditional jig danced by Caitlin and Mollaigh McPeake. It was a very successful nights entertainment by the young (and old) musicians and hopefully we will be able to get a recording of our appearance on the ‘Gig’n the Bann’ stage where only the night before the likes of Beoga and other high class acts performed.